I got hold of some rather nice heavy duty aluminum extrusion that measures 90 X 180 mm and had a fairly large center cavity that I thought would be perfect to run the ballscrew in. All I needed to do was to open up the top section of the extrusion thus creating sort of a tunnel for the screw to run in. It also had two circular cavities to use for fixing the ballscrew bearingblocks. In this photo the X-axis and Y-axis are nearly finished and work are about to start on the Z-axis column. 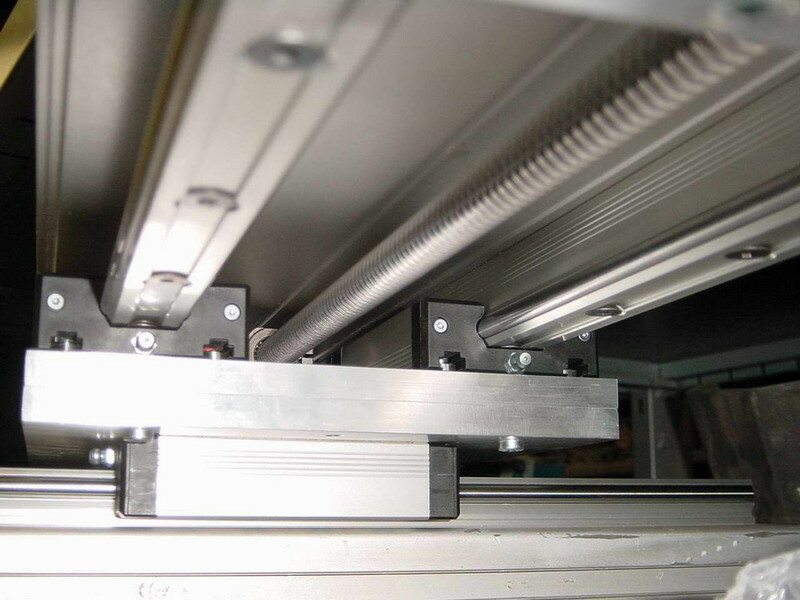 You can clearly see ballscrew running in the "tunnel" of the extrusion on the Y-axis and on the top of the Z-axis column you can see the profile of the extrusion. 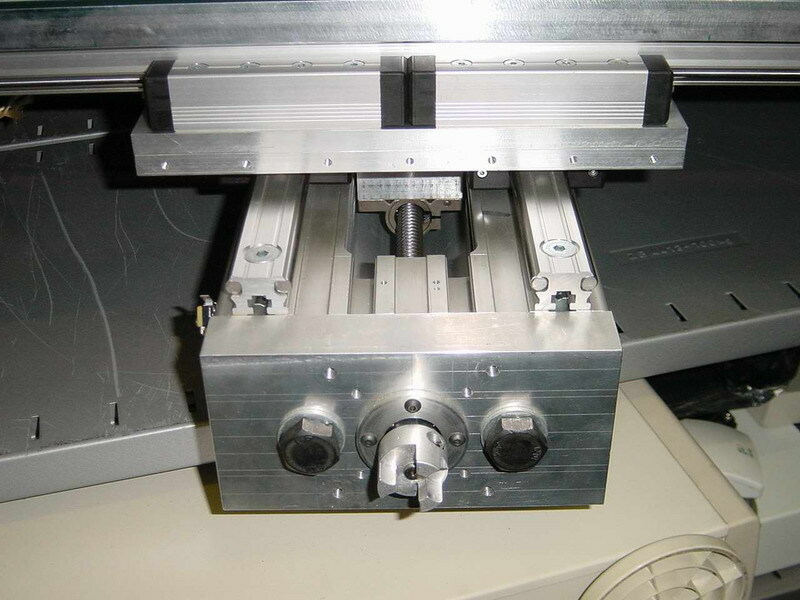 Here's a closeup of the "business-end" of the Y-axis linear ways and ballscrew as well as the "sadle" and the X-axis linear bearingblocks. 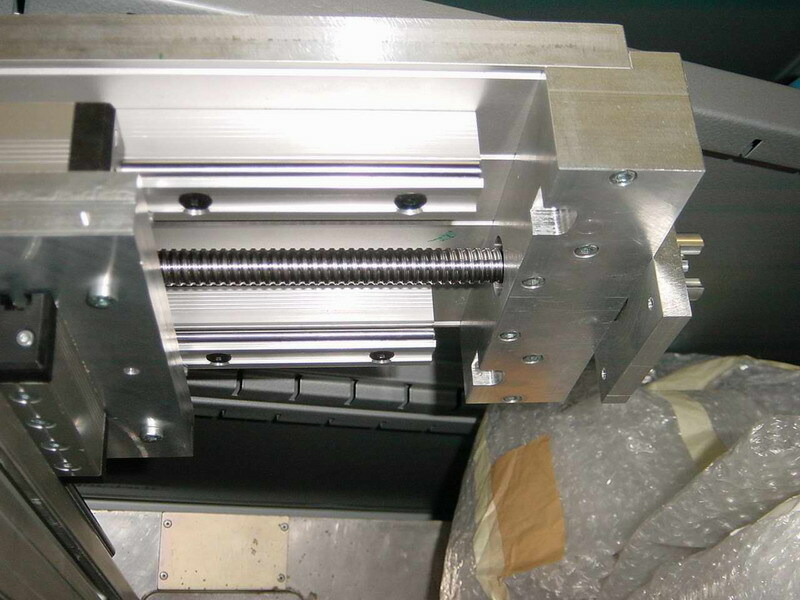 The ballscrew (from Isel) is hold firmly in place by two angular contact bearings inside the aluminiumblock. The outer races of the bearings are mounted with a spacer between them and held in place by the flange. The inner races are then preloaded against each other by tightening the nut on the ballscrew (not visible in this photo). This effectivly holds this end of the ballscrew in place. At the time I hadn't decided what motors to use so the block where drilled and tapped for both NEMA 23 and NEMA34 motors. Two aluminium plates of the same dimensions where fly cut to make them flat. 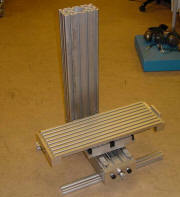 One was then drilled to be mounted on the Y-axis bearingblocks and the other to be mounted on the X-axis bearingblocks. The Y-axis plate (bottom one) have slightly oversized holes lined up with threaded holes in the X-axis plate and the plates are fixed together with screws. This allows the axies to be adjusted slightly so that they are perpendicular to each other. 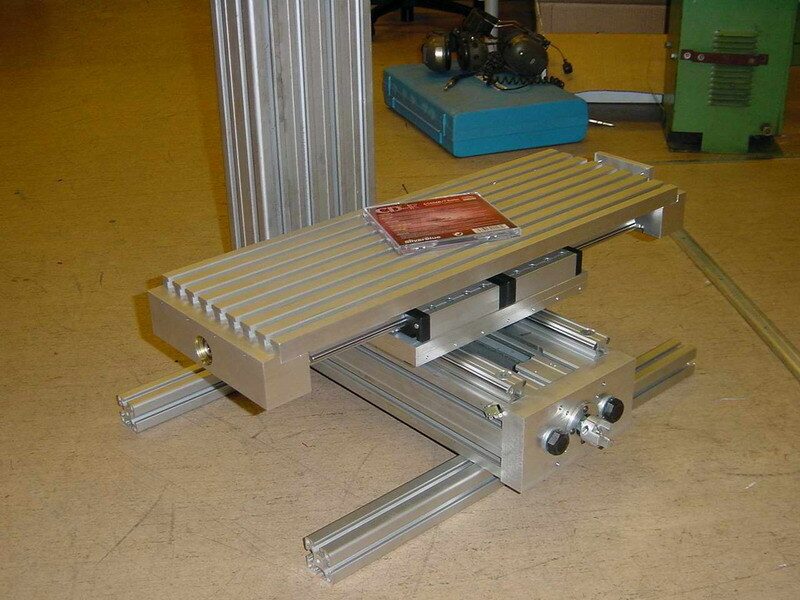 At the bottom of this picture you can see the base of the machine, the Y-axis linear ways and bearningblocks. Then there's the two aluminium plates, the X-axis linear blocks and it's linear ways which is screwed to underside of the table. Running down the center of the table is the X-axis ballscrew with it's ballnut far in there, between the bearingblocks. At first I intended to use one linear block per rail for the X-axis but ended up using two. That lost me roughly 130mm of travel on that axis but it gained so much rigidity that i decided it was worth it. 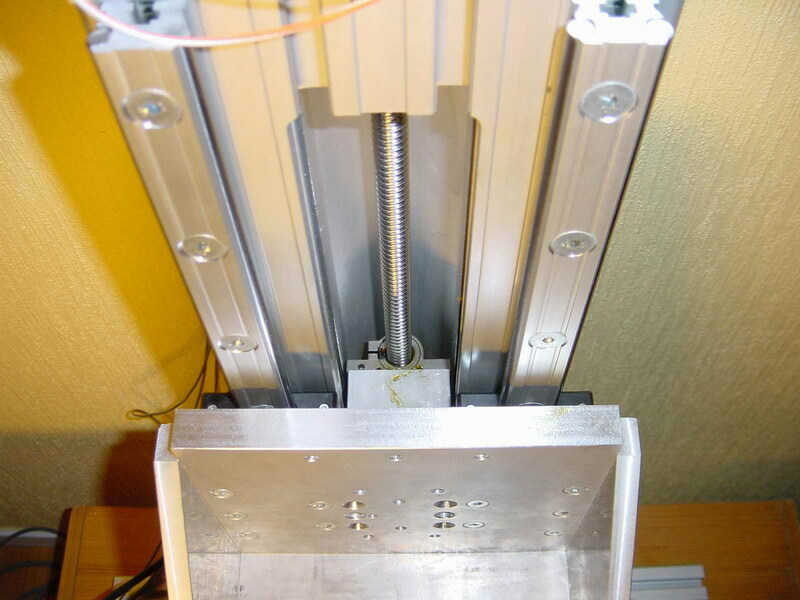 This photo shows the driven end of the Y-axis ballscrew. A piece of 50 X 50 mm aluminium bar holds the angular contact bearings for the screw. The bearing block is then mounted to the table by the six M5 screws. The two milled out sections on each side of the block is for clearence for the linear bearings lubepoints when the table is at it extreme end of travel. Here's another view of the same piece. You can see flange holding the angular contact bearings in place, the shaft coupler and the mounting plate for the stepper motor. Also visible is the T-slots on the table. The small holes on the side, just below the table were intended for screws to further fix the block in position to the table but it turned out not needed in the end. This is an overview of the base, X and Y axis and table. With a CD cover for size comparation. The Z-axis is constructed in the same way as the Y-axis. Except that the lower end of the ballscrew is hold in a bearingblock which is just tightly pressed into the cavity of the aluminium extrusion. 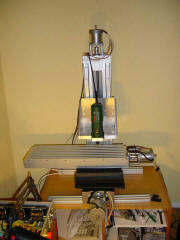 This picture shows the Z-axis viewed from the top down. 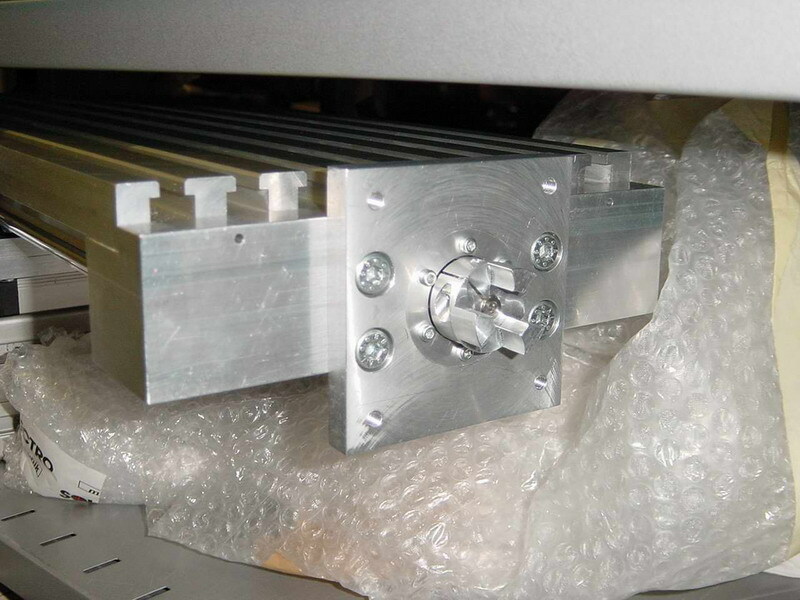 You can see the linear rails and blocks, the ballscrew and nut and the spacerblock that attaches the nut to the actual Z-axis. Here's an overview of the machine as it looked when the initial testing begun. The spindle in the picture is a Bosch 600W router but it has since been replaced by an ER16 collet spindle and 3-phase motor with VFD-control. In the lower left corner you can see part of the electronics cabinet and if you look closely you can see the three wonderfull G210's. You can find out more about the electronics here.